NAIROBI – Tac collections in Kenya have slowed down, when compared to growth in the economy. 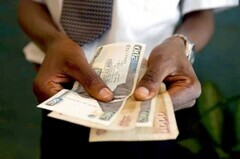 New information released by the World Bank in its 16th Kenya Economic Update report has shown that the tax-to-GDP ratio in Kenya has fallen to its lowest level in a decade. Over the 2016/17 financial year, the tax-to-GDP ratio fell to approximately 16.9 percent, even though the total level of revenues rose by 13.3 percent. However, the growth in the level of tax revenues was outpaced by growth of the nominal GDP levels, which reached 14.9 percent in the same time period. The World Bank explained that while the economy in Kenya grew at an impressive rate, the government coffers didn’t enjoy the same positive boost due to inadequate efforts to ensure tax compliance. It was noted in particular that the sale of goods and services saw a significant boost, without a corresponding boost in tax revenues, and, also, that agriculture currently makes up a quarter of economic activity but pays the least corporate income tax when compared to other sectors of the economy. The World Bank has now revised it projections of Kenya’s economic growth from 5.5. percent to 4.9 percent for 2017, and noted that the hole arising due to the missing tax revenues must be plugged by foreign debt.